The 42nd NHK Taiga Drama is MUSASHI. 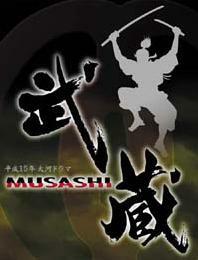 Many Japanese history buffs are familiar with The Book of Five Rings written by Miyamoto Musashi in the 17th century. Musashi's treatise on strategy and the way to lead instantly became the business executive's bible when the translated version hit the bookstores more than three hundred years later. In 2003, the story of this legendary swordsman-philosopher-painter comes to life in the NHK Taiga Drama MUSASHI. Based on the famous biography written by Yoshikawa Eiji, this taiga drama boasts a list of stars that reads like a Who's Who of screen and television. Orphaned before he was ten years old, Musashi (his real name is Takezo, so you'll hear his childhood friends call him by that name) grows up skilled in the martial arts. During the Battle of Sekigahara, he fights on the side of the losing Toyotomi forces, but eludes the enemy as they hunt down the vanquished soldiers. He then spends years wandering the countryside mastering the sword, becoming a stronger samurai. As his fame spreads throughout the nation, men seek him out to test their skills against him--most notably Sasaki Kojiro who faces Musashi in the ultimate Duel at Ganryujima.